We have seen a large increase in patients in my Victoria Tx dental office looking for dental implants. Many patients want a dental implant to replace one or more missing teeth. The benefits are that they are able to avoid crowns on teeth that don’t need it as in the case with a dental bridge. They can also replace removable partial dentures, The implant does not need to be attached to any other teeth and stands alone, functioning just like a natural tooth. When patients come in missing multiple teeth in the back of the mouth, for example. In many of these situations, we can even make an implant bridge. The reason for this is that it can save the patient the expense of having four implants placed where that many teeth are missing, but rather only having 2 implants placed on either side and a bridge connecting them. Other patients come in with dissatisfaction because of loose dentures, or even want to entirely replace the denture with nonremovable hybrid dentures. 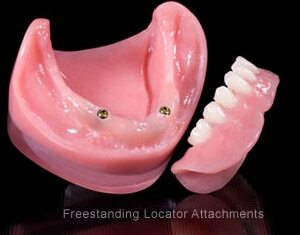 Traditional dentures stay in place mainly by a suction cup effect. If that suction is disturbed by anything then the patient will have difficulty eating foods that require vigorous chewing. The most common complaint with dentures is typically with the lower denture. The reason is because the lower jaw is usually smaller than the upper, therefore less suction can be achieved. The other reason is that the tongue and the floor of the mouth have to move in order for patients to function, and that movement can cause instability of lower dentures in many patients. So, for patients who are having any sort of difficulty with their dentures or even want to get rid of their dentures entirely, dental implants are the best option. There are a variety of approaches to improve denture function with implants. The simplest way is to place 2 dental implants under the denture in the front. 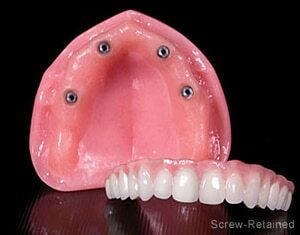 This is referred to as an overdenture. The denture is still a traditional denture that primarily relies on suction, but the implants snap into slots under the denture and give a lot more stability, greater chewing force , and resistance to shifting. Sometimes 4 dental implants can be used for even greater denture retention. On the other end of the spectrum, 5 or more implants can be placed and a hybrid denture can be made. In this case, it will look and function very similar to a patient who has natural teeth spaced out with a bridge made over them. Hybrid dentures do not rely on suction , but entirely upon the strength of the implants. They are typically screw retained so they can be removed by the dentist for repair or cleaning. Another added benefit of adding implants is that implants keep the bones around them more stable over time. You know the old adage “if you don’t use it you lose it”. When teeth are missing, there is not root to put pressure within the bone and stimulate it, therefore the bone shrinks every year, which is one reason why dentures get loose over time. The implants act like teeth roots and stimulate the bone to remain dense and full, which is an added benefit to having dental implants.